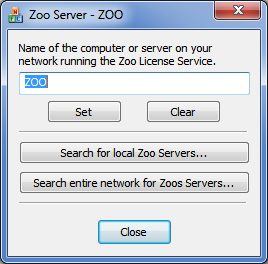 How Can I Find My Zoo Servers? Summary: Solving the “Where are my Zoo servers?” question. My organization is using the Zoo to manage its Rhino 4.0 licenses. But, nobody around here seems to know what computer the Zoo server is running on. How can I discover this? The SetZooServer.exe utility, one of the Zoo Bonus Tools, not only assists in configuring workstations for Registry Key lookup. It also will search your network for Zoo servers. This is a great way to find out were your Zoo servers are.